Ceramic tile is a popular choice for kitchen tile. Choosing tile for your kitchen floor can be a rather daunting prospect. There are so many choices these days, with many different materials in a range of colors, that it is easy to get overwhelmed. Check out this quick guide to help make the process of choosing tile much easier. If you thought tiles for kitchens were just those plain old ceramic tiles that everyone's been using for decades, think again. These days, there are many different choices when it comes to kitchen materials. Ceramic tile is an excellent choice for kitchen flooring and backsplashes. Ceramic tiles come in a wide range of colors, styles and levels of durability. All are suitable for use on the backsplash; look for tiles that have a matte finish and that have been fired twice in the kiln for durability to use on the floor. 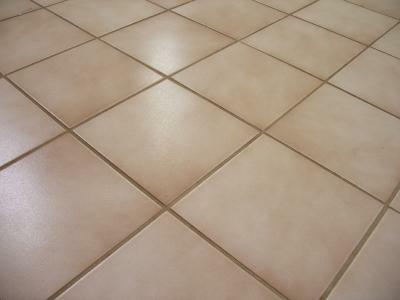 Ceramic tile is easy to clean and is non-porous, so it doesn't absorb water or other things spilled on the floor. It doesn't pick up smells and is easy to keep from staining. Ceramic tiles come in a wide range of colors and designs, so going with the classic doesn't have to mean basic. Select textured, 12-inch tiles for the floors and use a handmade subway tile with lots of variation for the backsplash for traditional looks. Another option is to select a sleek 6 by 24-inch plank for the floors with clean edged 4-inch tiles for the backsplash. With so many choices, you'll be able to mix and match for the perfect design. Vinyl tile is a budget choice for your kitchen floor, but that doesn't mean it has to look cheap. In fact, there are high-end vinyl tile styles available now that mimic the look of wood, marble and stone. 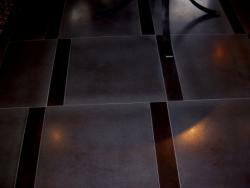 What's more, installing vinyl tile is relatively easy and a good do-it-yourself project. Vinyl is resistant to water but it is prone to scratching if crumbs are allowed to collect on the floor. Regular sweeping and wet mopping can keep your floor looking great for years to come. Vinyl can also be installed on your kitchen backsplash for an inexpensive and modern twist on the material. Try cutting up the squares of vinyl into smaller sections and mixing colors and patterns for a custom look. One of the most popular new looks for the kitchen is stone tile. Many different kinds of natural stone are available for both flooring and backsplashes, including granite, limestone, slate, marble and travertine. Stone kitchen tiles add warmth and beauty to your kitchen, especially if you have a matching kitchen counter. The tiles aren't pleasant to walk on with bare feet (because they get cold) and if you drop something, it's a sure bet that it will break. Stone tile should be sealed, and regular maintenance to remove stains will keep your stone looking nice. If you have a stone counter in the kitchen, seal the floors, wall and backsplash all at once to save time. 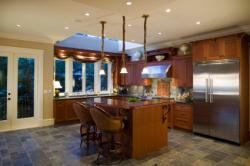 A kitchen flooring tile that is gaining in popularity is cork tile. Cork is a renewable resource and makes a soft, cushiony floor because of the natural air pockets in the cork. It is available in parquet tiles that are simply glued down in planks with tongue and groove joints. Cork tile is incredibly durable and won't be harmed by furniture or high heels. It is resistant to chemicals and abrasion and is relatively easy to maintain. While glass tile may sound modern, it's actually been around for centuries. New manufacturing processes have made glass the perfect material for your kitchen backsplash, or as an accent tile for your floor. Look for recycled glass to match a recycled glass or quartz composite countertop, or large, smooth glass tiles with minimal grout lines. Glass tiles can be cleaned with regular glass cleaner and are excellent in dark kitchens because they reflect and multiply light. They also come in so many colors, textures and patterns that you'll find one to match any kitchen design. Porcelain is highly durable, extremely dense tile made from compressed clay dust and fired to extremely high temperatures. The result is a tile which has color going right through from front to back. Porcelain can be smooth, polished or textured as well as glazed and can be found in styles mimicking stone, metal, glass or even fabric. All porcelain tiles are suitable for floor use, but a few can also be found with matching trim pieces making them perfect for the walls as well. Use metal, linoleum and ceramic backed materials anywhere in the kitchen design. Square laminate tiles are meant to be floated over a subfloor and are not suitable for wall use. With so many types of tile to choose from, it may seem overwhelming when you begin your search for the right tile for your kitchen. Remember that while there are countless choices perfect for many kitchens, that not all of them will be perfect for yours. To help you narrow down your choices, consider the following before you begin your search. Counter: Pick up the colors for your floor out of the countertop design. Granite, quartz and even solid surface counters are frequently full of subtle shades of color perfect for floor tiles. Maintenance: Not all tiles are perfect for homes with children or pets. Stay away from stone, vinyl, metal and other materials that require frequent sealing or that scratch easily, particularly if you live a busy lifestyle. Over-arching style: Keep the tile selection in tune with the rest of the room. There are plenty of choices in every price range to suit every style, so don't get hemmed in by price. Visit their websites and request a showroom in your area to see the products in person. Once you've picked the material you want for your kitchen, think about any design elements you want to include in your flooring scheme. It's fine to have tile that matches all the way across a room, but if you want to jazz up the look of your floor a bit, you can add a mosaic or another design to the tiles.